Most wireless technology is fast enough these days to deliver not just one, but several high-definition video streams. 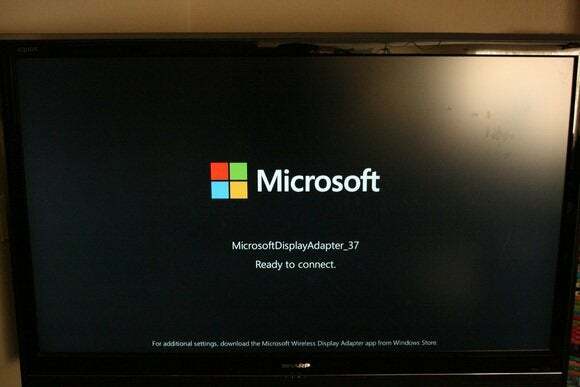 But the Miracast technology Microsoft included in devices that connect your phone and PC to your TV doesn’t quite hold up under heavy load. In the past few weeks, Microsoft announced two very different ways to bridge the last few feet between your connected devices and your television: the $100 Microsoft Screen Sharing for Lumia Phones HD-10, and the $60 Wireless Display Adapter. The first, to connect smartphones, was developed at Nokia. The other was independently developed at Microsoft, before the merger brought the two together. 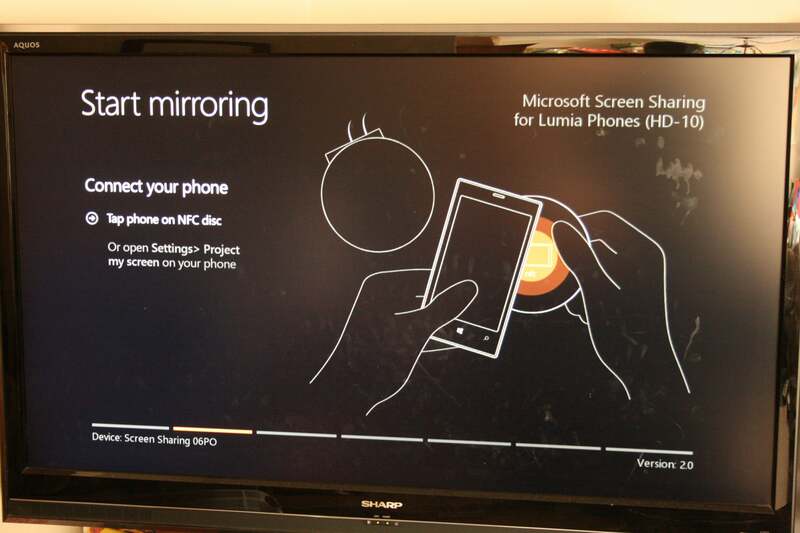 The Microsoft Screen Sharing for Lumia Phones HD-10 (left) and the Wireless Display Adapter. That sounds like a superior solution compared to Chromecast, Google’s $35 streaming stick, which a user controls via his or her smartphone. But I’m not sure it is. The difference is in the technology: The Chromecast connects to your phone or tablet, then downloads a stream from Netflix by itself. With Microsoft’s solutions, any data they receive is fed via your phones or tablets—fine for projecting photos or documents. That extra hop those devices require, however, when streaming video from the Internet—from Netflix, say, through your phone to the Miracast device—seems to make all the difference. There’s just enough latency to be annoying. Compared to the Wireless Display Adapter, the HD-10 seems a bit over-engineered: nifty, but unnecessary. 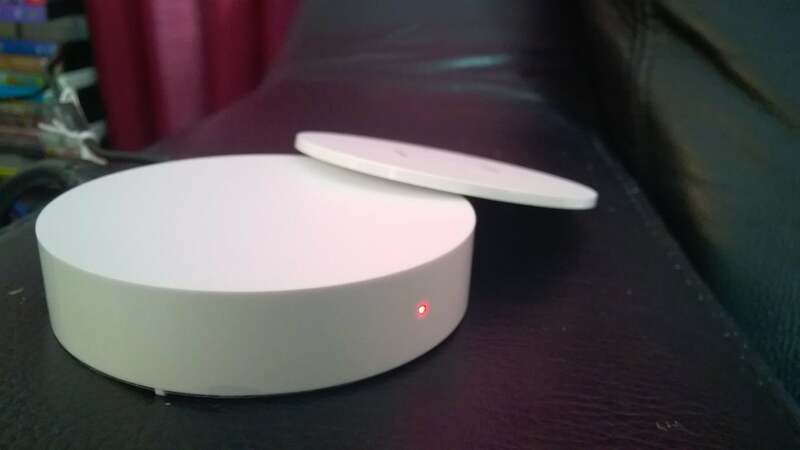 It’s a round, white, hockey puck, with an HDMI connection and power cord in the back. But what’s unique about it is the detachable, NFC “coaster” that sits atop it. If you turn on your phone’s NFC connection and tap it to the top of the coaster, it authenticates it to the device and allows it to connect. The HD-10 has an odd little removable NFC coaster on top that’s used for authentication. Pairing your phone to the HD-10 is like pairing a Bluetooth device: Open NFC, tap the phone, and accept the pro-offered wireless connection. 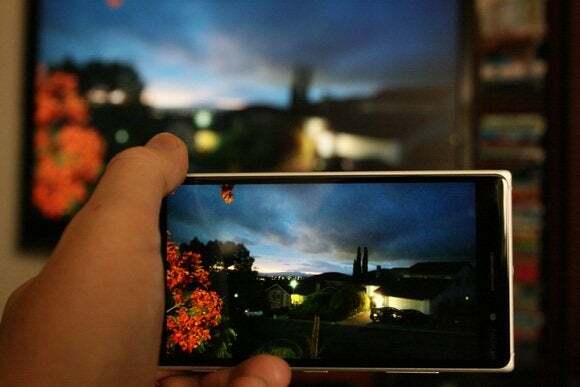 When connected, your television mirrors your smartphone display—which, chances are, will be oriented vertically. Your phone’s vertically oriented display will look a bit odd until you rotate it. The first time I paired a Lumia Icon with the HD-10, the performance was lousy. Photos were speckled with pixels as the HD-10 caught up to the wireless data. 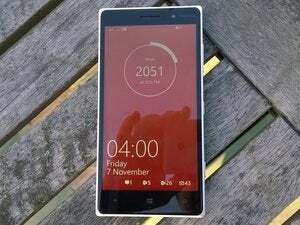 But connected to Microsoft’s latest Lumia 830, the lag was barely noticeable. Photos rendered smoothly, as did video captured and stored locally on my phone, with just a hint of lag on 1080p video playback. Even Netflix was oh-so-close to being perfectly watchable. The default HD-10 interface, which helps you connect your phone or tablet without additional assistance. I’d attribute part of that to the longer cord length. The HD-10 requires a flat surface, like a router, exposing it to a line-of-sight connection. The Wireless Display Adapter hid behind my television, close to the HDMI ports. It’s possible that the additional interference from the TV made the difference. “It will make your Surface an even more powerful tool for sharing and collaboration,” Laycock wrote. 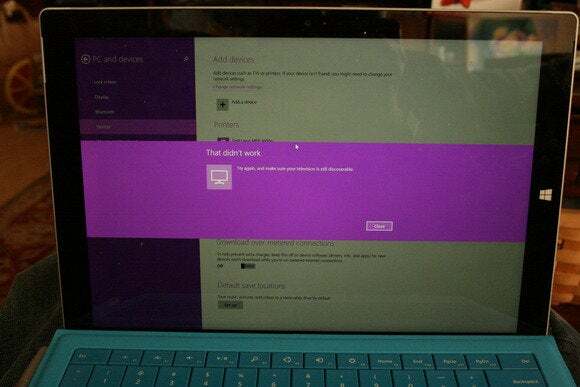 I consistently received this message when I tried to connect using the Surface Pro 3. A Lenovo Thinkpad Twist, however, worked without a hitch. But here’s the problem. It doesn’t work with the Surface. Or at least the Surface Pro 3. I tried: swiping in from the right, asking the SP3 to project to a second screen, finding the Wireless Adapter, and connecting to it. Each time it failed. I made sure the Surface was patched and up to date, rebooted the adapter—nothing. I know the adapter works, though, since my Lenovo ThinkPad Twist connected to it straight away. Microsoft representatives claim they haven't had reports of the problem, so it's possible it was something specific to my hardware. 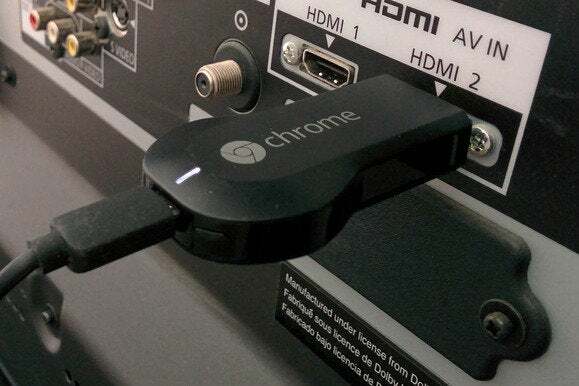 Like the Chromecast, the Wireless Display Adapter is a dongle, a small stick that plugs into an available HDMI port on your TV. A separate USB cable plugs into the service port (or a plug) and provides power. Plugged into an HDMI connector behind my TV, the Adapter didn’t stream video quite as fast as the HD-10 across the room. But when I tried again, about three feet from the adapter, the latency noticeably improved. In either location, the Adapter performed well cycling through photos or sliding a mouse pointer across a document, as neither required a lightning-fast response. I stress-tested both of Microsoft’s devices using video as a way to push the wireless connections to the limits. That might have been a bit unfair, since Microsoft has never really emphasized the HD-10 or the Wireless Display Adapter as anything more than a simple way to project documents and images from your mobile display to an HDTV. 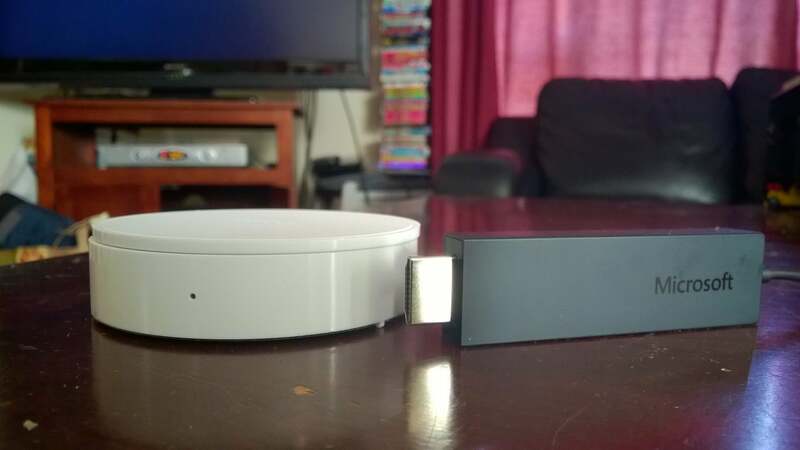 The small Chromecast dongle connects in much the same way as Microsoft’s Wireless Display Adapter: as a small dongle that plugs directly into your HDMI port. But there’s already a cheaper option that does all that: the Google Chromecast. Provided you have one of these supported phones or tablets, you can also cast your screen to a Chromecast, allowing you to share, say, a PowerPoint presentation via Office Mobile for Android. To be fair, a shared Chromecast screen felt slower than using Miracast technology. But in applications where latency really matters—say, streamed video via Netflix or another service—chances are that a dedicated Chromecast app exists. And, of course, the Chromecast is markedly cheaper—cheap enough that it might be worth simply paying $35 or so to see if it works for you. Threre’s even a fourth option: a wireless presentation mouse. Unless you need access to a physical keyboard, you can connect your notebook directly to a TV via an HDMI connection, then use the mouse to control the PC across the room. Expect to pay about $50 or so, depending on the quality of the mouse. That’s not to say that Microsoft’s hardware isn’t capable, or with an exception or two, can’t do the job. Right now, however, I’d recommend the Chromecast as a cheaper solution that might be good enough for what you need.